» Tough choice: Stop or roll through? Tough choice: Stop or roll through? This is one of the stop signs added on Front Avenue N.E. to slow traffic. 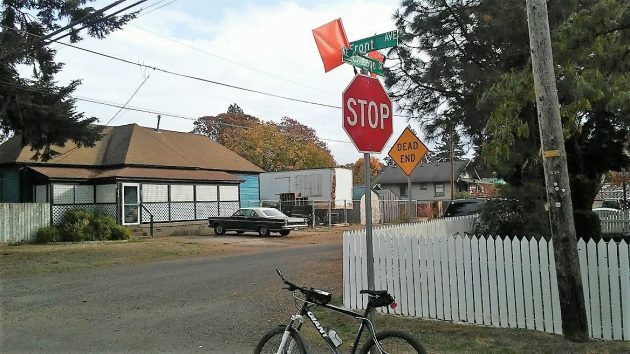 Like other residential districts of Albany before it, the Willamette Neighborhood now has sprouted a crop of new stop signs to slow down traffic. This may work, or it may not. Front Street, part of my favorite bike route through town, is where I noticed the change last week. The city put up two stop signs there, at Chicago and Columbus Street. I thought this was odd, because Front carries traffic to and from Simpson Park and the Talking Water Gardens. Why stop through traffic when there’s almost no traffic from the cross streets, especially the one block of Chicago that is a dead end? What happened was that people living near East First and Second Avenues had been concerned about traffic. On Aug. 6 the Albany Traffic Safety Commission heard from the residents. “A common theme was that the lack of stop signs on 1st and 2nd Avenues contributed to increased traffic volume and speed along those roads,” according to the minutes. In response, the city staff had come up with a “pattern of alternating stop controls” similar to what exists in other neighborhoods. And after hearing from the residents, the three members of the traffic commission present voted to adopt that pattern, putting stop signs on First Avenue at Oak and Cleveland streets, on Second at Sherman and Pine, and on Front at Chicago and Columbus. The stop sign on Front at Chicago N.E., a dead-end street. With all due respect. Any driver just rolling through needs ticketed period. The biggest problem in neighborhoods is people perception of speed when not behind the wheel is usually incorrect. Not to say there aren’t some speeders but when the traffic studies are done they nearly never indicate an actual addressable issue. Rather than just saying no when it’s the proper response. The city offers all kinds of Mickey Mouse “solutions” to placate the residents who insist there is an issue even when they are presented with data proving otherwise. 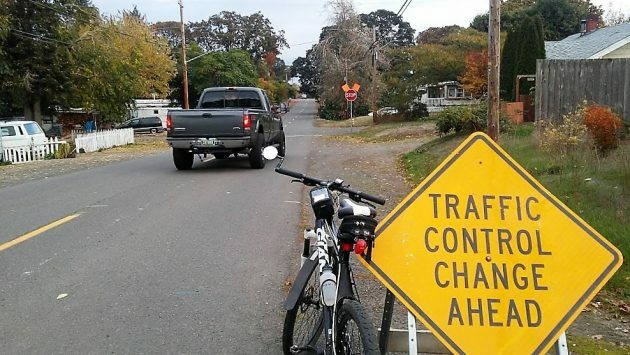 I wonder if alternating stop signs were installed in much of the square-grid parts of Corvallis (same in Albany?) to establish “traffic streets” and discourage driving elsewhere, because side streets are usually as wide as the main thoroughfares. Too wide in my opinion, but that’s a different issue. Makes for clumsy bike riding, but I can speed through a good diagonal route zig-zagging through side streets without encountering stop signs. Probably more dangerous than disobeying the “full stop” law. While putting up signs shouldn’t we dump the “Dead End” signs? They are so last century and demeaning to those living on the street as losers. It should be the P.C. correct term “No Outlet” to put us up to date! A “dead end” has no cross streets and ends abruptly. A “no outlet” leads to cross streets, but no separate exit. Come on, James, “dead end” is the highest distinction for a residential street. It means almost no motorized traffic, thereby increasing property values. To improve things even more, add a walk/bike path to an adjoining dead end. Now you have a street where “losers” can’t afford to live, hence nobody to be demeaned. This situation is not unlike the con job Walmart pulled on the City Planners. Walmart/Supercentres promised that overnight camping would be policed and forbidden in the massive parking lot. Walmart even went thru the motions of putting up “No overnight parking” signs to prove their sincerity. The City Moms and Pops fell for the con because they were too busy drooling over the property valuations. Now, on most mornings, the Walmart parking lot is akin to a full service KOA, with the added benefit of more than a few homeless folks living in their cars all parked right next to the No Overnight Parking. Of course, the Mayor has determined that homelessness is a lifestyle choice, so perhaps Walmart can be excused in those cases. Like President Trump, Hasso Hering understands the sway he holds over Albany. For decades he’s manipulated locals with Trumpian ease. And like Trump, Hering is fully prepared to use his Bully Pulpit to advance his cause. Mr. Hering – words have consequences. Your ginning-up unlikely stories citing unreliable sources will eventually backfire. We congratulate you on your cunning even as we note your fictional propensities. Wow Linda….what a “segway” using a musing on a stop sign into bashing Trump. You Liberal Socialist Democrats just can’t let go that YOU lost the election. Be patient & bid your time as the pendulum will swing back. Bless your heart…..
We should be thankful that we have a person of H.H. thinking that brings items to a forum for discussion & comment. Wouldn’t happen in N. Korea!!! The Willamette River East Neighborhood group, WREN, was formed to make our neighborhood better. We are not working toward gentrification or PC rules and regulations. We are simply trying to make our neighborhood a safer place to live. To do this we get involved in issues such as the drag racing on First Ave. We work with City government, social service agencies, and other Non-Profit groups. Sometimes our ideas are ignored or blown out of proportion by others, but sometimes our ideas work out well. It’s how things get done! My response to the nay-sayers is “Get involved”. Don’t just sit on the sidelines and criticize.